Distractions are EVERYWHERE! At work, at home, in our car. It’s incredible how often they pop up and how derailing they can be (if you let them). I know when I have dozens of things on my “to do” list, that’s when I’m most susceptible to distractions because often times I don’t know where to start, so I start with the easy, little things like responding to emails and other messages or I find myself searching for a new podcast or audio book to listen to. This article from A Life of Productivity states that “the average person is distracted or interrupted every 40 seconds when working in front of a computer.” Every 40 seconds! That means if you ever want to get anything done you’ll have to intentionally eliminate distractions from your work space. I’ve discovered several tips that help me buckle down and get to work and they don’t include fancy productivity apps (because honestly, those can just become another distraction) and I don’t necessarily have to lock myself in a dungeon in order to get things accomplished. 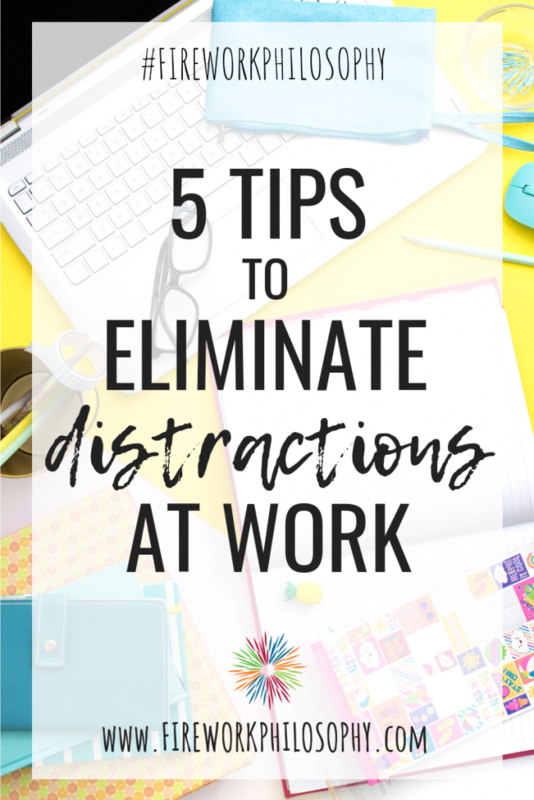 These are my most effective tips that are simple and do-able in whatever type of office setting you’re in to help you eliminate distractions at work. One of the biggest distractions for me at work is having too many tabs open in my internet browser. I utilize a lot of different online programs for my job, I maintain several websites and social media sites and I usually reference files in Google Drive on a daily basis so it’s easy to get a little tab happy. But when I’m focused on getting a specific task completed, I close out of all tabs that aren’t relevant to the task at hand to prevent myself from aimlessly clicking from one tab to the other, which is what I find myself doing when I get stuck on a project and am pondering how to proceed. Eliminating all the extra tabs helps you stay focused on the necessities of the task at hand. Email is a necessity in this day and age, however it doesn’t mean it has to control your schedule and productivity. Start by shutting off email notifications that pop up on your computer and/or phone. That way, when an email does show up in your inbox, you’re not distracted like the dog from the movie Up that saw a squirrel. Take it a step further by closing out of your email altogether and only check emails during specific times of day or after you’ve completed your high priority tasks. Chances are the emails you receive aren’t urgent (if they were, the sender would have called) so designating a specific chunk of time to respond to emails will help bump up your productivity. The same goes for text messages. I’ll put my phone on silent and turn it face down so the flashing light won’t capture my attention either. Then, I’ll only check my phone when I’m done with the task at hand, I’ll respond to any necessary messages, I’ll avoid clicking over to my social media folder and I’ll keep plowing through my “to do” list. 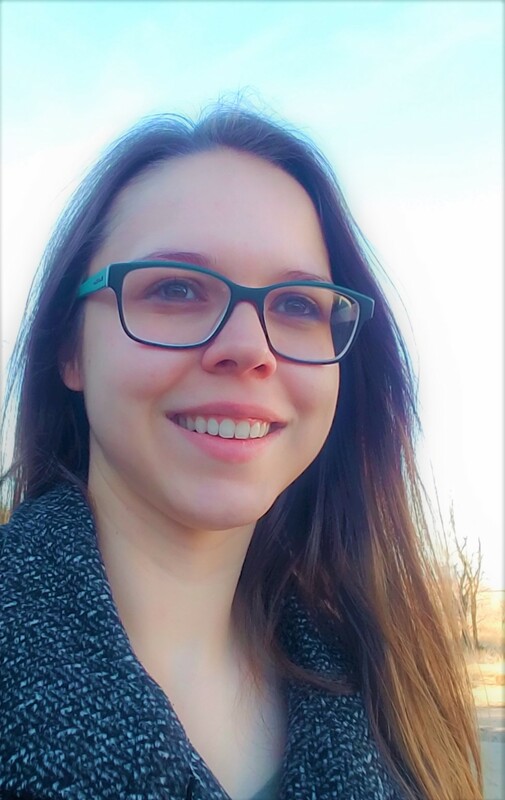 I utilize social media for my work and my blog quite frequently so having the apps on my phone is extremely convenient…sometime too convenient when I’m subconsciously looking for a way to distract myself from doing what needs to be done. I remind myself to be intentional with my time on social media (meaning I should really only use social media when I have something work or blog related to post) by adding all of my social media apps in a folder on my phone which takes several clicks to get to. They’re not on the main screen when I unlock my phone which makes me put in a little extra effort to find them in the first place. Unless you often utilize social media for work-related tasks like I do, you could also uninstall the apps from your phone altogether. Make a list. Not just any list. A realistic one. I’ve found that when I add two or three major tasks to my list that I must accomplish that day, I’m much more productive compared to when I add five or more in the hopes that I’ll find the time to tackle them all. The reason for this – as we all know – is that distractions will happen. The phone will ring, people will stop in the office, urgent matters will come up. By accounting for the distractions that are essentially a part of your work anyway, you’ll feel more productive by accomplishing the two or three highest priority tasks. I like using small, bulleted stationary notes which help me from making my daily “to do” list unrealistic with 327 tasks. I also like my double white board system that I use at work – one for the tasks I must get done that day or week and one where I can capture all of the other tasks I know need to get done but know it probably won’t be able to happen that week. I love absorbing new content from podcasts and audio books and bumping up my energy level with music but I know there are certain tasks I can focus on better when I don’t have the extra noise. If I’m doing something that’s somewhat mindless like stuffing envelopes or designing flyers, the audio works for me. If I’m writing or doing something that’s taking up a little more brain power, I find that I work better without the extra noise. Discover what works best for you. Do podcasts, audio books and music help spark creativity or keep you motivated to plow through certain tasks or do they distract you from working efficiently? Do you work in an office setting or a different type of work environment? 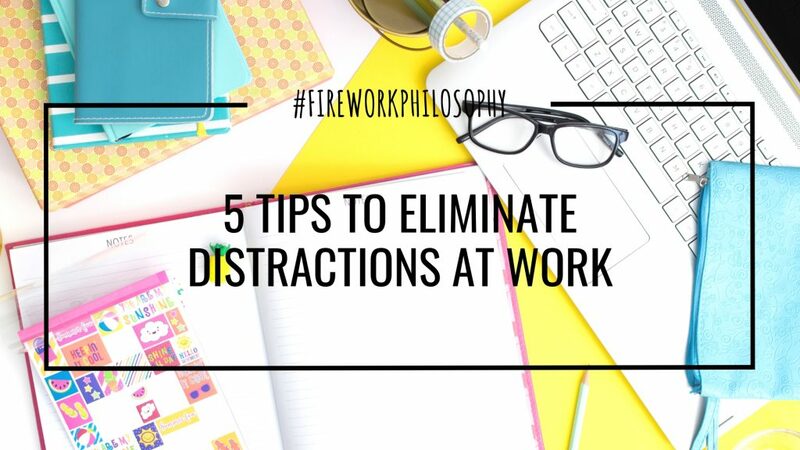 What are some of your top tips to eliminate distractions while you’re at work?